On 26 September 2018, EFG and the European Geosciences Union (EGU) jointly convened the ‘Horizon Geoscience: overcoming societal challenges, creating change’ dinner debate. The event aimed to facilitate a dialogue between the 80 scientists, policymakers and industry professionals present about how greater collaboration can be achieved. 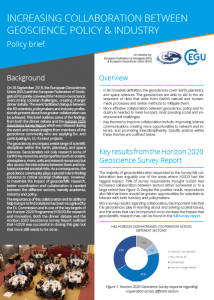 A policy brief has now been released by both organisations which outlines some of the findings both from the dinner debate and the Horizon 2020 Geoscience Survey Report which was launched during the event and reveals insights from members of the geoscience community who are applying for, and participating in, EU-funded projects. The brief follows the outcomes of the event’s high-level panel and round-table discussions, highlighting the need for more eﬀective collaboration between geoscience, policy and industry to meet Europe’s most pressing economic, social and environmental challenges and outlining the steps that can be taken to achieve this collaboration. You can read the policy brief here.